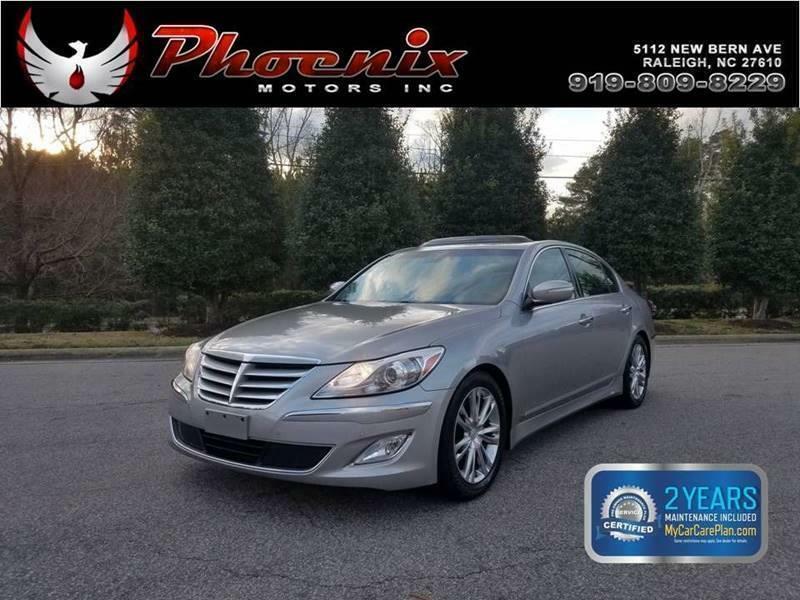 I would like to learn more about this 2013 Hyundai Genesis 3.8L 4dr Sedan. Please contact me as soon as possible! Offering style, features and power, the 2013 Hyundai Genesis represents a sensible alternative to more expensive luxury sedans. The 2013 Hyundai Genesis is a full-size, rear-wheel-drive luxury sedan available in 3.8 and 5.0 R-Spec trim levels. Standard features for the Genesis 3.8 include 17-inch alloy wheels, automatic headlights, LED running lights, foglamps, heated mirrors, full power accessories, dual-zone automatic climate control, keyless ignition/entry, leather upholstery, heated front seats, an auto-dimming rearview mirror, Bluetooth, a seven-speaker audio system with CD player, iPod/auxiliary input and satellite radio. The Premium adds 18-inch wheels, a sunroof, power-folding outside mirrors, automatic wipers, leather dash and door trim, driver seat memory functions, a power tilt-and-telescoping steering wheel, a power rear sunshade, a navigation system, a 7-inch touchscreen display, a rearview camera and a premium Lexicon 14-speaker surround-sound audio system. The Technology package bundled with the Premium features adds adaptive xenon headlights, adaptive cruise control, a lane-departure warning system, front and rear parking sensors, upgraded gauges, premium leather upholstery, a ventilated driver seat, heated rear seats, hill-hold assist, a more advanced navigation system with a larger 8-inch touchscreen display, enhanced Bluetooth phone functions with audio connectivity, Hyundais BlueLink telematics system and a 17-speaker Lexicon audio upgrade with six-disc changer. The 2013 Hyundai Genesis comes standard with antilock brakes, traction and stability control, active front head restraints, front and rear side airbags and side curtain airbags.